Indianapolis Motor Speedway Historian Donald Davidson, based at the Indianapolis Motor Speedway Museum, developed a passionate interest in the Indianapolis 500 as a teenager in England. Arriving at IMS in 1964, he delighted the racing community with his ability to recite year-by-year accounts of participants’ careers. Returning permanently in 1965, he was invited by Sid Collins to join the worldwide IMS Radio Network and was hired by Henry Banks as USAC statistician, remaining at USAC for almost 32 years. He was named Indianapolis Motor Speedway historian in 1998. Along with numerous television and radio assignments, raconteur Davidson has played host to the popular call-in radio show “The Talk of Gasoline Alley” on 1070 AM in Indianapolis during the month of May continuously since 1971. His writing credits include countless historical articles and columns, a pair of “500” annuals in 1974 and ‘75 and co-authorship with Rick Shaffer of the acclaimed “Autocourse Official History of the Indianapolis 500,” published in 2006. Donald, I interviewed you two years ago about the 1967 500. I always enjoy your insight into the 500. Your background is rivaled by very few. I was wondering if I could interview you about this year's race? Thank you Donald for taking us down memory lane. It is always a treat to hear trivia like this. To Donald Davidson: Theses memories of previous drivers are fantastic. You dont see these photos anymore. The offy was some kind of car. 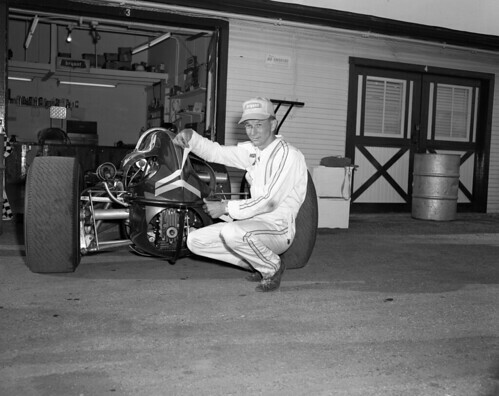 We saw Foster at the 500 and in film clips from other races, even some of the usac stock car races. The connection that I've always made has been Billy Foster triggering the multi-car accident at the start of the 1966 race.